To launch its Adicolor range, fitness brand Adidas has recently introduced colour pop windows at two stores in Delhi and Mumbai respectively. The window concept moves to in-store VM as well. To introduce Adicolor, the latest of Adidas comprising an entire range of merchandise and footwear, the brand has recently launched window that uses three primary colours along with supporting merchandise to present the whole look. Introduced in two stores in Delhi and Mumbai respectively, the Adicolor window is slated to be incorporated 15-20 flagship outlets across the country soon. 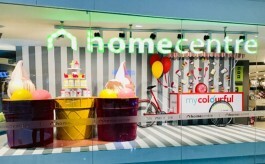 The window concept is carried to in-store VM through colour-coded podiums etc. Priyesh Bhagat, Manager – VM Planning, Adidas Originals India, told, “The modular wardrobe structures present in the window is made of MDF duco-painted in white. Each colour is further accentuated with LED neon lights of corresponding colours. The background uses vinyl print while the campaign text in 3D print has been pasted on window glass. 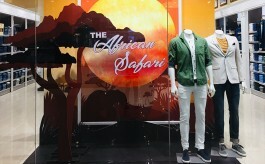 HG Graphics has executed the window in Delhi while Catalyst Design has crafted the Mumbai store’s window.